Cabinets are a great investment no matter what level of renovation you’re at. So you want to remodel the kitchen but don’t really have the budget right now to do the entire thing. What do you do? Do you wait until you have you entire budget and swing away at the old stuff? Do you forget about the entire project and mope around in your current, dinky kitchen? The answer is no: you remodel the cabinets! You might be thinking to yourself “why the cabinets?” Well, let’s break it down so that you all understand as clearly as possible. Walking into someone’s house, what are the first things you notice? One of the first things you notice is the counter tops. There really is nothing nicer than having nice, high-quality counter-tops. The problem here is that high-quality counter tops are usually pretty expensive, so you’ll probably need to invest your entire budget into just that, which doesn’t sound all that great. What do you notice next? Well, what sits on the counter? That’s right, appliances! You can learn a lot about people from what kind of appliances they have in their homes. If you’re looking to upgrade big appliances like your stove, microwave or refrigerator, you should really know where those components are going to fit best in the space you’re trying to create. We now return to the cabinets. 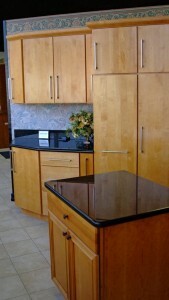 Cabinets are a good initial investment when beginning the remodel of a kitchen, piece by piece. If all you have is a big enough budget for one of these components, cabinets would be my first choice without a doubt. Cabinets are the skeleton to the entire kitchen holding your counter-tops which hold your appliances! If you plan on investing a lot in tops and appliances, it’s best if you do the same with your cabinets. There’s nothing worse than seeing a nice modern counter-top on some cheap looking stock cabinetry. If you plan ahead financially, do you homework and shop around, you should do fine. Starting out with the cabinets is a great idea, as it gets a lot of the work out of the way and sets you up for what you’ll need in terms of appliances and materials.